Helen Humphreys is a prize-winning writer, living in Kingston, Ontario who loves to write about nature, agriculture, and how people relate to them. 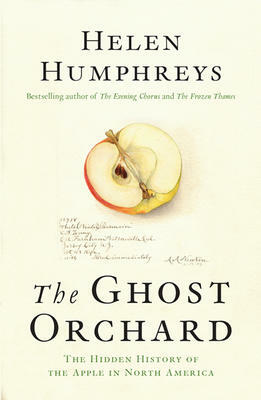 This book was inspired when she found a White Winter Pearmain – considered the best-tasting apple in the world – growing beside an abandoned cabin near her home. The book has superb colour photographs of this apple as well as a number of others. It has an imaginary chapter on how Pearmain might have been discovered, in England, AD 1200. But there are lots of actual facts about the history of apples, including how bountiful orchards run by the indigenous people of North America were stolen or wiped out by the white settlers and their armies. It was reckoned that there were some 17,000 varieties of apple available in the 1800s, and the U.S. Department of Pomology made a record of these. There is a fascinating chapter on Robert Frost, the poet, who had an orchard on his farm in Derry, New Hampshire and puts apples in many of his poems. When he moved to the UK, he became friends with Ezra Pound, as well as the English poet Edward Thomas, who loved to walk in the country, look for apples, and put them in their poems. It all makes this a charming book.